Boston, Mass., Yard in 1979 was substan- tially better than in 1978 because of the yard's success in obtaining contracts to overhaul U.S. Navy vessels. Raymond F. DeVinney, general manager of the facility, reported in a year-end state- ment recently that the yard had repaired about 112 ships overall during 1979, up slightly from the 99 repaired in 1978. With four Naval vessels in the yard for major work during 1979, employment was up to about 700, which is an increase of about 35 percent compared with the previous three- year average, Mr. DeVinney said. Truett, which arrived in October. Both are scheduled for completion in May. USS Barry began recently, with completion scheduled for next January. A new 12-page Technical Services bro- chure from Atlantic Diving Company, Inc. describes new underwater tools and tech- niques. It includes 14 on-the-job photographs and five technical diagrams. Technical Services brochure deals primarily with inspection: visual inspections, using closed-circuit TV, color still photography, and certified welding inspectors; cathodic protection inspections, dealing with anode installation, potentiometer surveys and ca- thodic protection monitoring; ultrasonic and magnetic particle detection, for steel thick- ness readings, wood and concrete testing, weld flaw detection. Norton (Va.) Reservoir dam. The dam was leaking 750,000 gallons of water per day through a number of leaks, and contributing to a local water shortage. Atlantic Diving Co. inspected the dam using visual, low-frequency ultrasonic, and core-sampling techniques. They presented recommendations to the owner, and ulti- mately repaired the dam with quick-setting cement, and underwater epoxy to seal all the leaks completely. The booklet details some of the new tools which Atlantic Diving Co. employs as part of their underwater technology, including the V-meter, which measures compressive strength nondestructively in concrete, wood, plastics and other coarse-grained material; the Haglof coring tool, which takes wood samples of timber piles; the bathycorrom- eter, a diver-operated device which measures the corrosion potential or cathodic protection of any underwater structure at any point on that structure; the D-meter, a portable thickness-measuring instrument which only requires access to one side of the structure to be measured (equally useful for ships' hulls and pipelines). 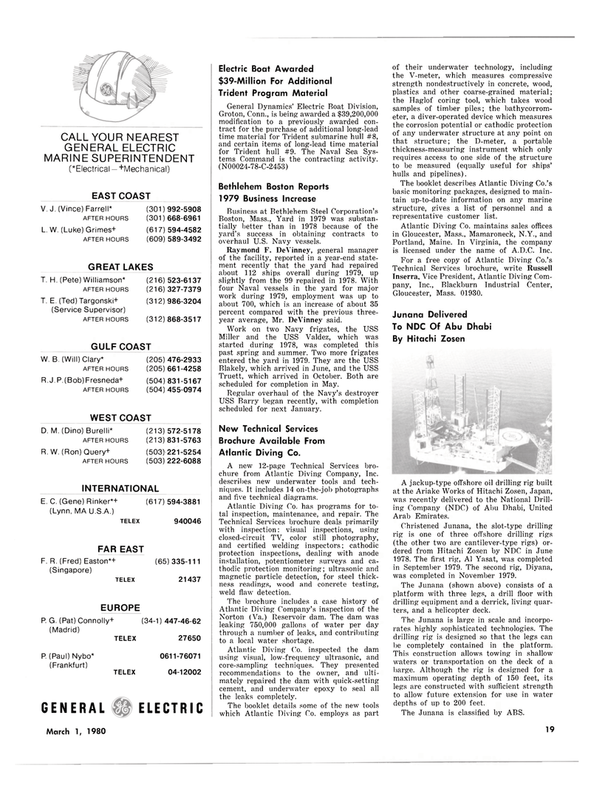 The booklet describes Atlantic Diving Co.'s basic monitoring packages, designed to main- tain up-to-date information on any marine structure, gives a list of personnel and a representative customer list. Portland, Maine. In Virginia, the company is licensed under the name of A.D.C. Inc.
Christened Junana, the slot-type drilling rig is one of three offshore drilling rigs (the other two are cantilever-type rigs) or- dered from Hitachi Zosen by NDC in June 1978. The first rig, A1 Yasat, was completed in September 1979. The second rig, Diyana, was completed in November 1979. The Junana (shown above) consists of a platform with three legs, a drill floor with drilling equipment and a derrick, living quar- ters, and a helicopter deck. The Junana is large in scale and incorpo- rates highly sophisticated technologies. The drilling rig is designed so that the legs can be completely contained in the platform.